We keep track of the best guitar contests and giveaways online. Win quality gear without having to sift through contests that are either hard to enter or not worth it. Enter at Sweetwater.com to win. Contest ends September 31. Fishman, one of the leaders in acoustic amplification is offering a guitar contest in which you can win a Washburn WD150SWCE Acoustic Guitar, which comes equipped with the Fishman Presys Blend preamp system. Contest ends September 31. Enter on Facebook. AmericalMusical.com is hosting a gear giveaway in which you can win a gigging rig from Gibson and Orange worth $5,000! Enter on Facebook. Contest ends September 31. Taylor Home Studio Giveaway and More! Contest ends September 30. Enter here. In the need of a new effects pedal? 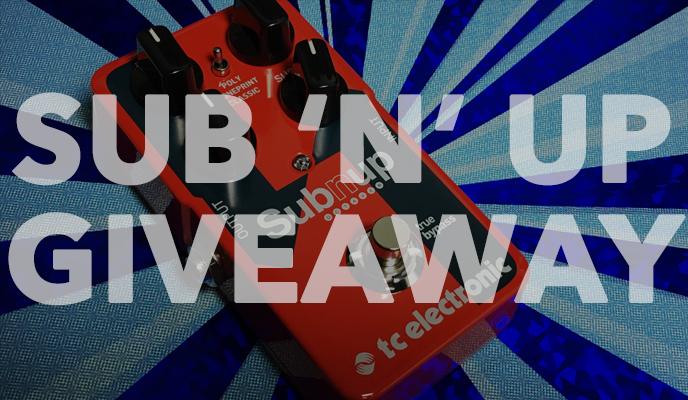 Prymaxe is offering you the chance to win a TC Electronic Sub ‘n’ Up Octaver. This content ends tomorrow, so head over to Prymaxe to enter! 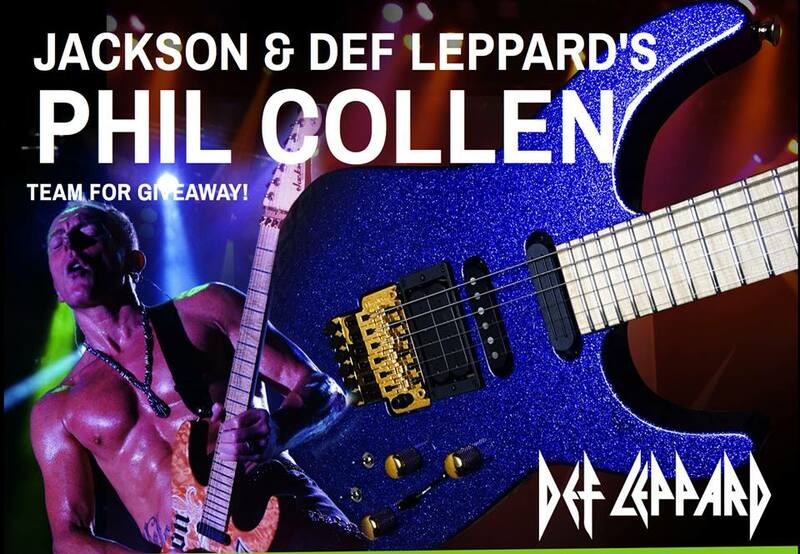 Jackson Guitars is offering you the chance to win a beautiful Phil Collen PC1 Electric Guitar. Crafted specifically for Collen for the summer tour, the custom-built guitar comes in a unique Purple Metal Flake finish, and is based off his USA Signature PC1. Features include a genuine mahogany body with maple top, bolt-on quartersawn eastern hard rock maple neck with compound-radius flame maple fingerboard and 24 stainless steel jumbo frets, licensed Fender® Strat® reverse headstock, DiMarzio® pickups (DP152-F Super 3 (Bridge), HS-2™ DP116 (Middle), PC1 Sustainer PC1 sustainer (Neck)), Floyd Rose® Original tremolo and brushed gold hardware. The contest ends October 10. Enter at Jackson Guitars. 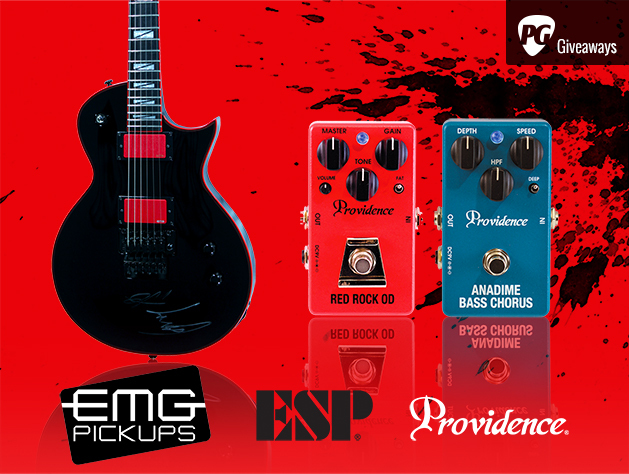 Premier Guitar is holding a gear giveaway in which you can win a Gary Holt Signature guitar along with a Providence ADC-4 Chorus & Red Rock Overdrive. With the classic ESP Eclipse body style the GH-600 is a 24 ¾ scale all Mahogany body, 22 fret Ebony fretboard, with all black hardware that comes loaded with Gary’s signature blood red EMG 81 (bridge) and 89R (neck) pickups. Top it off with red binding on the body and fretboard and glow-in-the dark fret indicators. Contest Ends October 17. Enter at Premier Guitar. 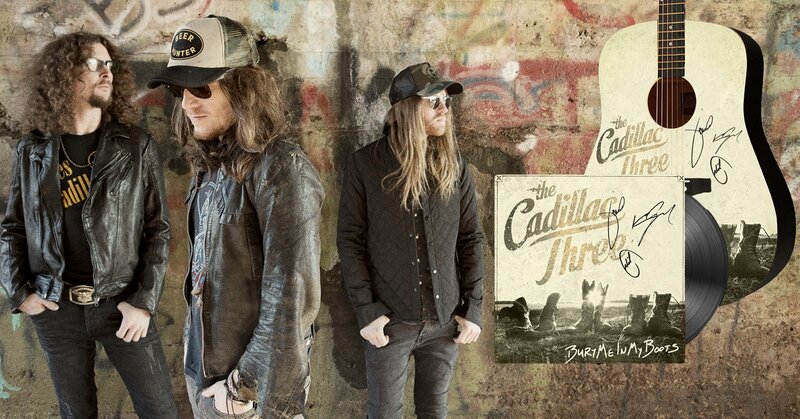 Cadillac Three is offering a giveaway in which you can win an autographed acoustic guitar and vinyl record of their album, Bury Me in My Boots. Better hurry on this one—contest ends August 26! Enter here. This week’s selection of gear giveaways feature some great finds from Sweetwater, Calton, and Disc Makers! Lowe Vintage Instrument Company is offering the chance to win and design your own custom Calton case for the instrument of your choice. If you’re not familiar with these cases, they’re basically indestructible and cost more than a lot of instruments! Head over to Facebook to enter. Disc Makers has a giveaway they’ve coined as the “Power Trio Giveaway.” This includes an Ibanez TM302M Talman Guitar, Ibanez TMB600NT Talman Bass, and a Tama IP52KCBK Imperialstar 5-pc. drum kit (with complete hardware and cymbals). Visit Disc Makers to enter. Contest ends September 30. American Musical Supply has partnered with Fender to bring you this awesome giveaway featuring the gear of Johnny Marr’s rig, worth almost $3,000! They don’t list how long the contest lasts, so I’d recommend entering soon! Click here to enter. Fishman is offering an incredible opportunity to win a 1960 Evolution Electric Guitar from Michael Kelly, which comes equipped with Fishman Fluence Multi Voice Pickups. Like Fishman on Facebook and then enter to win. Contest ends August 31! 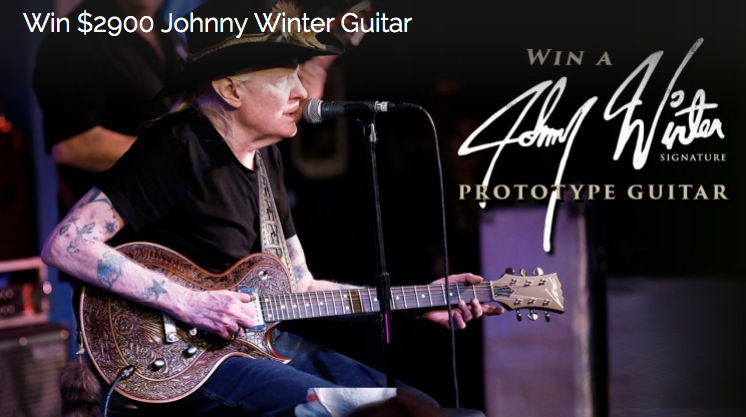 Here’s a beautiful guitar that you can win—valued at nearly $3,000, the signature Johnny Winter guitar by Dean Zelinsky is stunning! This guitar is a one-of-a-kind prototype, so best of luck in winning it! Enter here. Contest ends October 23!